Mammography is the most effective tool in both the screening and diagnosis of breast cancer, and is currently the only imaging technique that reduces the risk of breast cancer through early detection. According to the American Cancer Society, in 2009 over 250,000 new cases were expected to occur among women in the US alone. Because the earliest sign of breast cancer is most often an abnormality detected on a mammogram and age is considered the most critical risk factor, all women over 40 are advised to have a yearly screening mammogram. A mammogram uses low-dose amplitude x-rays to create an image of the breast. The breast itself is compressed so the tissue thickness can be evened out which produces the most high-quality images. Imaging techniques will vary depending on whether your mammogram is for screening or diagnostic purposes. Patients are discouraged from using deodorant, talcum powder or lotion on the day of their exam, as these can produce abnormal results- you will be given specific instructions on your exam during scheduling. 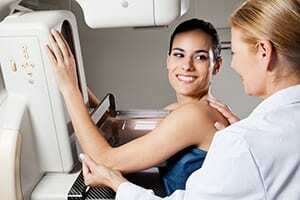 What can I expect/ How can I prepare for a Mammogram?